Yesterday the bulls made a fast ascending movement. During the previous a correction, I opened a short-term buy order. The target is in the area formed by three fibo-levels, 61.8%, 123.6%, and 38.2%. I’ll move the stop to the level where the order was opened, as soon as the price breaks the maximum. 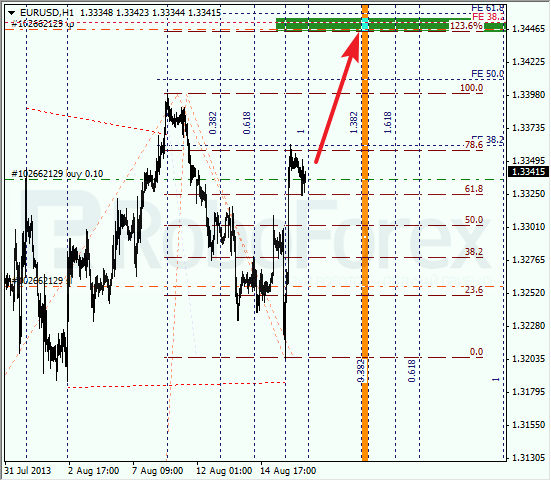 At the H1 chart, we can see additional fibo-levels in the target area, which makes it even more important. According to the analysis of the temporary fibo-zones, the predicted targets may be reached in the beginning of the next week. The bears took control over Franc again. The main target for them is at the level of 78.6%, where there are several additional fibo-levels. If the pair rebounds from this level, the price may start a new ascending movement. As we can see at the H1 chart, the correction is taking place, during which I opened a short-term sell order. The stop is placed a bit above a local maximum. We can’t exclude a possibility that the price rmay break the minimum during the day.